As the Dahlgren Heritage Foundation prepares to launch a major fundraising campaign next year, it will be receiving its largest contribution to date: a $50,000 grant next week from Dominion Foundation. 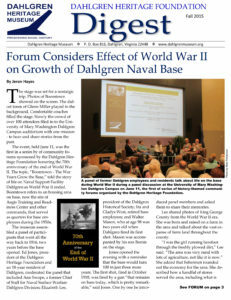 The Dahlgren Heritage Foundation for two years has been working with the Navy to launch the Dahlgren Heritage Museum. That is scheduled to open next year in the former Gateway Welcome Center on U.S. 301 near the Nice Bridge in King George County. “We are honored and grateful that Dominion has selected our project for this generous donation,” Robert Gates, vice president and fundraising chair of the Dahlgren Heritage Foundation, said in a press release. Gates is heading up a $2 million capital fundraising campaign that will help the museum open with a series of events and forums focused on initial exhibits. Aviation at the Naval Support Facility Dahlgren is expected to be one of the first exhibits. With the latest contribution, the museum foundation as collected more than $200,000 in cash and in-kind donations. This year, the museum opened an exhibit on Dahlgren history, with a focus on women in science and technology, in the University of Mary Washington’s Dahlgren campus off U.S. 301 in King George outside the base. Rodney Blevins, vice president of Distribution Operations for Dominion Virginia Power, said the company was pleased to “support the beginning stages of a museum that will celebrate the history, culture and community of the Dahlgren area.” Dominion Foundation is the philanthropic arm of Dominion Resources. Blevins will present the grant to museum officials during a ceremony and reception Dec. 12 at the UMW Dahlgren Campus. Others speaking include: House Speaker Bill Howell, state Sen. Richard Stuart, Del. Margaret Ransone and Capt. Pete Nette, Dahlgren base commander. Ed Jones, president of the museum foundation board of directors and editor of The Free Lance-Star, says the organization has ambitious goals for the coming year. “During the next chapter for the museum in 2013, it’s time for bricks and mortar,” Jones said, adding that it will get a boost from Dominion’s contribution. “The museum is moving forward with a first set of exhibits” in the former welcome center. “These exhibits will include key artifacts that relate to the aviation history of the Dahlgren base,” Jones said. “Special events, including forums, receptions, volunteer days and lectures, will be part of an opening schedule next year,” in lieu of a traditional grand opening. Jones added that more regular use of the museum building will come as it moves forward with exhibits and artifacts along a “history trail” on the museum grounds. The museum plans to be a key participant in events celebrating the base’s 95th birthday next fall, Jones said. The foundation will work with Sen. Mark Warner to garner support among defense contractors, particularly those with links to the base. Planning for the museum began more than two years ago to gather, protect, display and explain materials from the Dahlgren base. It’s the first of a new generation of Navy Heritage Centers run not by the Navy, but by private foundations.